Arizona walk decks have become increasing popular throughout the country as a wonderful way to enjoy the outdoors from a home. In some area homes, these special decks are often more noticeable than in other areas of Arizona. In particulary, wrap-around decks are very popular in picturesque areas. Here, the homeowner’s wish to enjoy the scenary from each direction of their home is readily accomplished. That is why these types of decks are most often found in areas of mountains, forests and lakes. Phoenix walk decks, offer a beautiful home enhancement to almost any home. Maintenance is an important part to make the deck last long. Deck coatings need to be washed from time to time, delaying or completely ignoring the decks maintenance will shorten its lifespan. Don’t forget that the deck needs to be painted and resealed by the manufacturer on a schedule recommended by them. There are several ways to waterproof your deck. There are different types of materials, which are used depending on the surface. Ignoring maintenance on waterproof decks can be very expensive. By hiring a walk deck contractor inspection annually, you can prevent your walk deck from becoming a problem. It is important to get involved in the installation of the deck, this way you have a say in the design of the project as well as how it will turn out. Although it is often advised to listen to the professional for walk deck installation, don’t forget to mention future building plans you may have for that area. One of the main reasons for the name walk decks is because homeowners can literally walk on the deck for more than just a few casual steps. With these lovely designed decks homeowners can actually walk the entire circumfrence of their home. 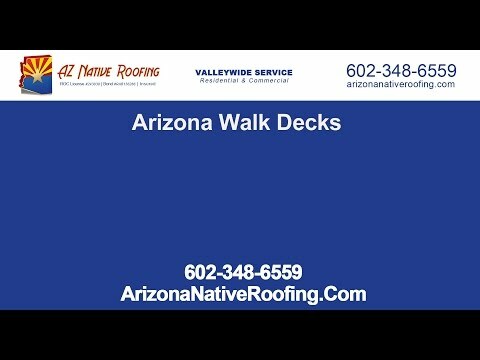 They are great for entertaining and family relaxation.For homeowners who wish to look into building this type of walk around deck onto their home, a good place to seek out an estimate is though a Phoenix Arizona roofing company and roofing contractor. Consumers should seek those companies who are familiar with how to build this type of deck on a home. As these decks are generally covered wraparound decks, they are an extension of an existing roof line and should flow accordingly. Walk around decks are also great for exercise in light inclimate weather conditions. These lovely home additions can offer fresh air and exercise even in light rain, as the covered roof allows for free unobstructed outdoor walking without exposure to rain. Consumers are encouraged to explore the many styles and options available for their particular home. With the guidance of an experienced Arizona roofing company consumers can learn the many potential styles and designs that will work to properly accent their home. An experienced professional can guide homeowners in how to design this type of Peoria walk deck so that the addition on the home will flow well with the existing structure. This addition should be a beautiful natural extension. If designed right these decks will be a great a home enhancement, and should not look like a gaudy addition to a home’s exterior. While these types of decks can go on literally any style home, they are frequently seen on colonial and contemporary style homes. Their added grace and style gives a unique flare to almost any home in Phoenix, Peoria, Scottsdale and Paradise Valley and provides a quaint elegance to the Arizona landscape. With Arizona’s many beautiful areas enhancing a home through this feature provides homeowners hours of extended outdoor added enjoyment for their home. Additionally, a well designed and built Wickenburg walk deck of this type offers a home a lovely feature that has a definite resale value.